I recently attended the wake of a friend’s mom and couldn’t help but contemplate how contemporary funerary rituals differ from those in world history (especially an open coffin). If you put your mind to it, I’m sure you could name at least a dozen cultures from different areas of the world where it was expected that not only would the deceased proceed to an afterlife that mirrored the physical world, but also took possessions with them in order to make that afterlife familiar. Ancient Egypt, Ancient Peru, Japan, and some cultures in Africa immediately spring to mind. 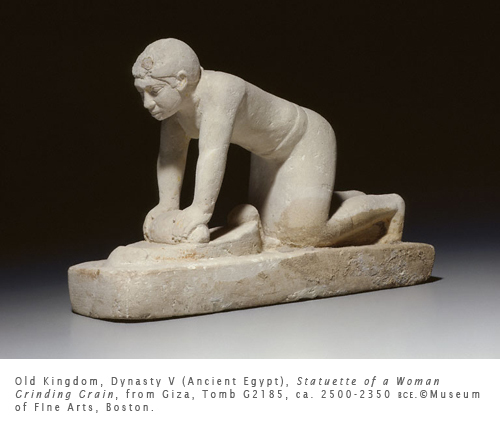 I think in the west we’ve gotten over the idea that we can “take it with us.” Objects such as this tomb figure show that we as human beings are wedded to the physical world in a way that — especially in the distant past — made it hard to let go of the physical life’s pleasures. There are many similarities to ancient Egyptian tomb figures in Chinese tombs. Not only did they surround themselves with their worldly luxuries such as ceramics and clothing, they also included figures of servants who were meant to, as in Egypt, magically entertain the deceased as the living servants had in life. This was, of course, a step up from Shang Dynasty (ca. 1523–1028 bce) burials which included pets, servants, horses, and guards killed to accompany the deceased (the wealthy, obviously). This was also a practice in some ancient Mesopotamian cultures (2000s bce). 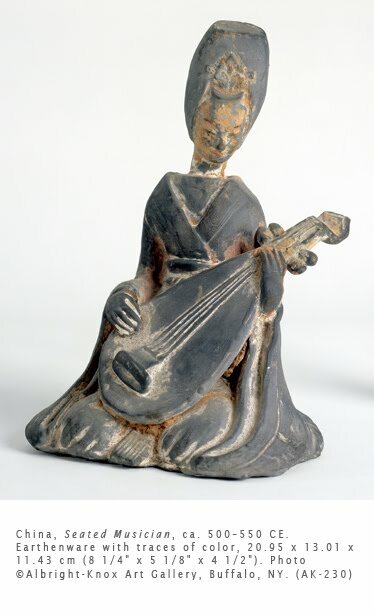 From the Zhou Dynasty (1027–256 bce) through the Song Dynasty (960–1279 ce), human sacrifices were replaced by ceramic figures of familiar human attendants. If you compare the wide range of figures across cultures, they present charming images of domestic life from everyday work (an Egyptian grinding corn) to works such as this Chinese example of a household servant playing music. During the Six Dynasties period (220–589 ce) — the period in which this figure was made—China was more or less in turmoil with numerous rival kingdoms in both the north and south. However, obviously, life (and death), went on. Figures from this period were made predominantly of black earthenware with the face and hands painted. During the Tang Dynasty (618–907 ce), many tombs of the wealthy were painted with scenes of pleasures in the everyday world, such as dancing and viewing a garden.